released 2004 in Porto, Portugal. 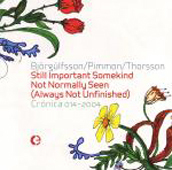 All tracks by Heimir Björgúlfsson, Pimmon and Helgi Thorsson. recorded live at De Melkfabriek, Den Bosch on october 5-6th 2002. Edited by Robert Hampson at Thirst, London in november-december 2002. Den Bosch, Björgúlfsson/Pimmon/Thorsson ALWAYS stay at the Golden Tulip.